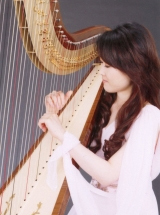 She started the harp with Junko Tabuchi and attended master class with Mari Kimura. She graduated with a mention très bien from the Conservatoire National Supérieur Musique de Lyon, France （class of Fabrice Pierre）. Upon graduation, she continued her education in Europe with the support of the Nomura Foundation. She has performed solo at such events as the Arles International Harp Festival in France and the 7th International Harp Congress in 1999 in Prague, and had many well-received performances at other various concerts. She is an active performer, having appeared as a soloist for concerto and as a guest with numerous renowned orchestras. She was the Winner of the professional section of the 10th Nippon Harp Competition in 1998 （International Competition）. She has received several awards such as the Osaka Cultural Festival Newcomer’s Prize in 1999 and the Honorable Mention Award of the Bravissimo Classica in 2001. A member of France International Harp Association, she has been a harpist of The Naniwa Orchestral Winds and the Kyoto Symphony Orchestra since 2003.